Fifteen years ago, few states had explicit legislation aimed to reduce bullying. Today every state in the country has adopted policies to minimize bullying. Overall, 28 percent of students reported being victimized in 2005 (when statistics were first collected) while 22 percent reported being victimized in 2015 (U.S. Department of Education). Bullying can establish a hostile school environment, lead to worse school outcomes, and have lifelong consequences for the victim as well as adverse effects on the perpetrator and bystander. Children who experience bullying in school are at increased risks for negative psychosocial outcomes, higher absenteeism and resulting underperformance, eating disorders, and mental health problems like anxiety disorders, panic disorders, and depression. Environmental and social factors generally influence someone to bully another person, but becoming a perpetrator can also increase an individual’s likelihood of substance abuse and underachievement in school. While technology in some ways more closely connects children and youth, it also puts them at increased risk of cyberbullying. This new outlet for bullying is creating challenges for schools as they attempt to decrease bullying among their students. According to dosomething.org, a global movement of 5.5 million young people making positive change, nearly 43% of all kids have been bullied online, with 1 in 4 reporting it has happened multiple times. The 2015 Youth Risk Behavior Surveillance System (Centers for Disease Control and Prevention) indicates that an estimated 16% of high school students were bullied electronically in the 12 months prior to the survey. And a 2015 study found bystander effects were similar in online and face-to-face conflicts, the higher the number of bystanders the less likely intervention would occur. In addition, the perceived anonymity that is allowed through online communication resulted in decreased interference by bystanders. The impact of bullying reaches far beyond the setting in which it occurs. For example, schools with students who skip school to avoid bullies face huge financial losses. A study done by the University of Texas at Austin, using California data, estimated that for every day a student is absent the school loses around $50. This revenue loss comes from state allocation of funds to schools based on attendance rates; when absence rates are high, state funding declines. That $50 per student per day added up when 10.4 percent of students report skipping school at least one day a month because they felt unsafe. This resulted in $276 million in lost revenue within one year for California public schools. Of the students who avoided school, about half reported that they “felt unsafe because of being targeted for bias” associated with race, gender, disability, or sexual orientation. The National School Climate Center found variation between reporting by teachers and reporting by students. 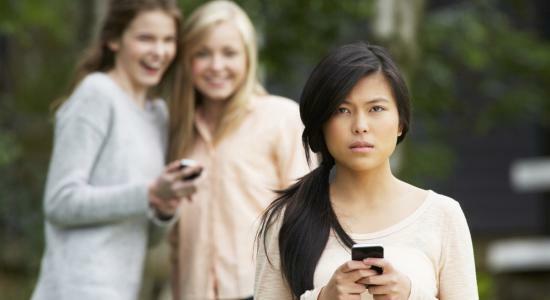 Students reported bullying as a significantly more pressing matter than teachers did. Similar results emerged from a survey done by the Prichard Committee Student Voice Team of the entire student body and staff of a central Kentucky junior high school that found no teachers felt bullying was a major issue, while 230 students explicitly mentioned bullying as the most prominent issue in the school. This research makes a strong case for letting students have a voice in addressing bullying. One student, Zachariah Sippy, describes why schools should work collaboratively with students to prevent bullying and talks about empowering himself to make a difference in his school. Student representatives in Albemarle County’s public high schools are now working together to create a new bullying prevention policy and act as role models for other students to encourage them to join the conversation about how to prevent bullying. The Deputy Director of the Learning First Alliance, Anne O’Brien, discusses the importance of giving students the tools to recognize bullying warning signs in themselves and other students. Allowing students to resolve their own conflicts with others also lets them be creative and learn to respect and validate the emotions of others. Because bullying can often involve a power imbalance, it is important that a person in an authority role also be trained to recognize the signs of bullying and acquire the skills to effectively respond to it. ASCD highlights a number of voices describing the skill set needed by educators and students to address bullying, intervene with peers, and create safe school environments. Read additional recommendations to avoid classroom conflict here. The 2010 U.S. Department of Education 11 recommendations for effective bullying laws have made inroads toward reducing bullying. States that implemented at least one of the recommendations on the list found 24 percent fewer reports of in-person bullying and 20 percent fewer reports of cyberbullying. Dr. Mark Hatzenbuehler, the lead author of that study, discussed the impact of the recommendations and the varying levels of success across 25 states and among over 63,000 students. This study is the most comprehensive evaluation of recommendations for bullying prevention among high school students. The study findings support the U.S. Department of Education’s 2010 recommendations as ways to reduce bullying. Read the full text of research here.